Ducklife 4 is more far more complex than youâ€™d expect from the title. In fact, itâ€™s a whole series of mini-games rolled into one. Players of the earlier games in this series will know how this goes: you have a duck. This particular duck has several stats that show just how good it is at different activities. Your goal? Train your duck until itâ€™s good enough to take on the best. Ducklife 4 takes this premise a bit further. You can now have multiple ducks and purchase accessories like hats and haircuts for them. New ducks constantly show up to challenge you, so thereâ€™s no danger of running out of things to do. Your duck has 5 things to be good at. The gameplay is based around training your duck. Each skill has a different training â€“ this is the real fun: everythingâ€™s a series of minigames. You earn money by playing these training sessions. This is the real core of the game: the controls and the gameplay are entirely different from minigame to minigame, and thereâ€™s a ton of fun to be had while you max out those stat bars. The longer you survive, the faster each challenge gets. Itâ€™s going to take you a while to get your champion ducky in decent shape. The actual competition against your rival ducks is, in comparison, pretty automatic. Depending on your stats, youâ€™ll either win the race or collapse halfway. Itâ€™s like the Chocobo races in Final Fantasy 7: you do what you can beforehand and pray your bird wins the race. Itâ€™s good. It takes a while to build up a good racing bird and earn enough money, so thereâ€™s a certain amount of necessary but fun grinding involved to raise those stat bars. The graphics arenâ€™t much to talk about. Theyâ€™re clean, crisp and minimal, devoid of much texture or effects. It isnâ€™t much of a detriment to the gameplay: once the minigames start speeding up you barely notice anything. The ducks have bare-bones but quite functional animations that fit well with the art style. All in all, the graphics do their job and no more. The music is quite accomplished, with a quite distinct theme song backed up by several other unobtrusive tracks. The final word: if youâ€™ve got some time on your hands, check this out. You wonâ€™t get far in a minute, so bewarned â€“ this is something to play and enjoy until your duck is as good as it can be. Itâ€™s also polished and pretty addictive. I give it 7 out of 10. If you like the idea of a persistent game that you can return to time and time again, try your hand at ducklife. Youâ€™ll like it. 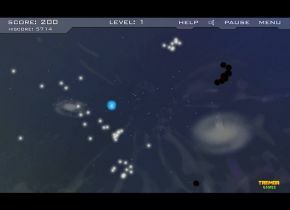 Ion Swarm from Tremor Games is a minimalistic experience. The game puts you in command of gently drifting specks of blue matter. Your first task? To use these particles to capture the grey blobs of neutral matter. Captured grey matter turns into more blue matter. These you hoard, build up and shape into a force that you can use to obliterate the clumps of dark matter scattered across the level (by colliding into them). These are your only goals. The game starts off with a small tutorial that teaches you this, and then youâ€™re on your own. Capture, and obliterate. Thereâ€™s no plot or storyline, just gameplay backed by matching, space-like visuals â€“ mostly particle effects - and electronic music. Surprisingly, this game is much, much tougher than you might expect. Sending a speck of blue matter into a speck of dark matter will give you â€“ one speck of grey matter. So far so good. But be warned: dark matter can capture the grey stuff, too. In every assault you need enough blue matter to wipe out the dark and capture the resulting greys; otherwise you end up giving the bad guys (in this case, the bad blobs) more numbers for their clumpy armies. This you learn within seconds of your first collision with the dark. For such a minimalistic game, this gives enough depth and strategy to actually require the player to think well before moving. Since the dark matter usually outnumbers your blue matter, the game sees you targeting and nuking small, localized bits of dark matter before aiming for the bigger clumps. The strategy in this Ion Swarm is one of numbers. My only gripe with the game are the controls. The system is well-implemented, but the paths that the particles follow to your target are pretty arcs that fools you into thinking you got the selection wrong. While this takes a match or two to get used to, itâ€™s not a major gripe. The game is simple (even the menus are minimalistic â€“ no unnecessary buttons!) , the music and visuals match perfectly without getting in the way, and itâ€™s very easy to pick up and play. Randomly generated levels ensure that youâ€™re always be able to play it without getting bored. A solid, enjoyable game.